Warhammer games, as plentiful as they are, can have some pretty good ideas. Warhammer: End Times - Vermintide provided for a fast paced, well polished fun time with friends, and Warhammer 40k Space Marines had wonderfully violent and meaty gameplay against intelligent AI. 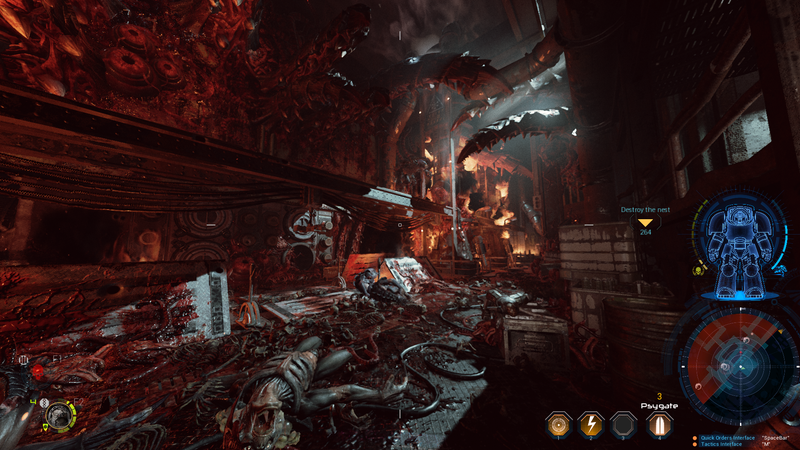 Space Hulk: Deathwing is none of these things. Note: Press copy provided by developers. The gameplay itself is mapped out very well but failed horribly in execution. Guns aren’t fun to use and are very often useless, forcing you to rely on your teammates who, if they’re AI, won’t have the best aim. Guns which literally fire tiny missiles take as many as five to six shots to kill an enemy a fifth your size, and the guns which kill enemies any faster are too slow or innacurate to be worth your time. In the end, it feels like every gun is bad, but some are slightly less bad than others. Most of the gameplay consists of going from point A to point B and moving on and its fairly repetitive. There’s no sense of enemy variety and the AI is some of the worst I’ve seen since Aliens Colonial Marines. Thankfully unlike Colonial Marines, the AI actually attacks the player (most of the time) but instead of the enemies-all-over horde gameplay you get from Vermintide, or for the best example, Aliens vs Predator, you get enemies in what’s almost a literal conga line because the pathing is so bad. I often looked at where enemies were coming from, and they’d be clipping into each other trying to follow the path their AI tells them to follow. Its predictable, boring and frankly annoying. The game looks pretty good, but the constant feeling of claustrophobia is appallingly tiring and makes you want to stop playing the game much earlier than you normally would. There’s also an ugly film grain on the game that you can’t seem to turn off. The game doesn’t run very well so even though the game looks good, you have to turn the graphics settings down to hit 60 frames per second. Critics like Totalbiscuit, when trying to play the beta, could not even get the game to hit 60 on his DUAL SLI TITAN GRAPHICS CARDS. The UI is terrible and was clearly made for consoles. The command wheel used to command your AI squad mates is impossible to use with a mouse because it constantly targets the wrong option and suddenly you’ve healed the same teammate twice and you’re dead. Just so much about the game is undercooked and unpolished its appalling. So much opportunity is wasted for a fairly decent squad based dungeon crawling shoot-em’ up whereas we instead got whatever this is. Worst of all, when I played the game at launch there was a horrific bug that replaced most of the audio with static and I couldn’t play it for weeks from the dread of experiencing the bugs of this game. All they had to do was make Vermintide in space, but instead we got a repetitive slog with no semblance of balance in its gameplay. If you’re looking for a fun online Warhammer game to play with other people or your friends, look to Warhammer: End Times - Vermintide. The game has an active player base, has much more content, looks better, runs better, and is all around much more fun. Edit: This article previously failed to mention the press-provided copy of the game was provided by the developers. For this mistake, I personally apologize -Geo.